I'm a little nervous about posting my brownie recipe. You see, several days ago I was catching up on Amanda's posts over at Fake Ginger and saw her October post about someone's brownies that were supposed to be "all that" and they weren't! Here is my brownie recipe. Made with cocoa rather than chopped chocolate because I prefer a cocoa brownie. If you're looking for a cakey brownie, stop reading. I've always been in the chewy brownie camp. Chewy, but not gooey ("gooey" usually being more flatteringly referred to as "fudgy," though what it really is is gummy!). Since Amanda's idea of "the" brownie is a chewy one, this might be "the" brownie recipe she's been looking for. Maybe not. But everyone I've made these for raves about them, so here goes ... (Disclaimer: Notice I simply said "might be just what you're looking for"--NOT "these are the. best. brownies. ever," though they just might be!) Where do you stand in the great brownie debate? 1 Preheat oven to 350F/180C/Gas4. 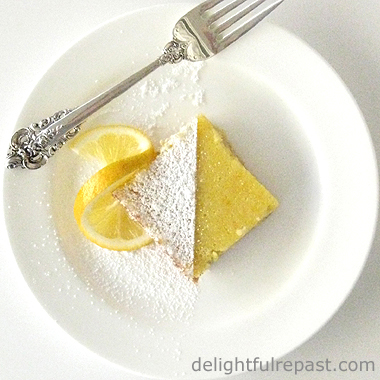 Butter, or spray with cooking spray, a 13x9x1-inch quarter-sheet pan or 13x9x2-inch metal baking pan. 2 In 1-quart bowl, whisk together flour, cocoa, baking powder and salt. 3 In 2-quart glass measure, microwave butter for 2 minutes, or until melted. Stir in sugar, vanilla and espresso powder or coffee concentrate. Add eggs, one at a time, beating well after each addition. Add flour mixture to wet mixture; beat until well blended. 4 Pour into prepared pan. 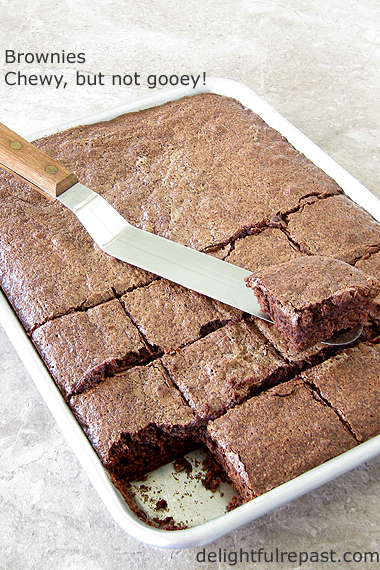 Bake for 25 minutes, or just until brownies begin to pull away from sides of pan. Do not overbake. I'll say that again: Do not overbake. Cool completely before cutting into 24 squares. Brownies will keep for several days at room temperature in airtight container with wax paper between layers. They look fantastic! And I love that you don't have to melt any chocolate. Thanks, Amanda. Not having to melt chocolate saves a lot of time and mess AND money! Oh, yeah, chewy all the way. I still have the first brownies I made, and use them regularly to sharpen drill bits. So, what's the secret part where batter decides between remaining organic or turning into a brick? Less flour? Lower heat? Not baking until weapon's grade? Just do exactly as I tell you, Sully, and you won't have any problems (I'm talking about the brownies, but it would probably work for other things as well)! Do NOT overbake! Half-baked? Yeah, that's right up my alley...er, oven. Bur don't underbake either. Then you end up with gooey. Not good. Sounds absolutely wonderful!! Might be just the thing for the snowy Sunday we are supposed to be having here in Boston. 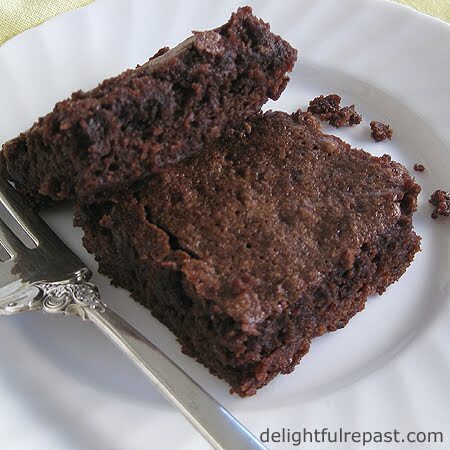 I'm usually a tea person, but I think a nice hot mug of decaf coffee would go great with a brownie right about now! Happy snow day! I think that the key to making the best brownies is, as you state in your instructions, not to overbake. When they're taken out of the oven they continue to bake a bit longer as they're cooling off. Enjoy your brownie and decaf. Personally, I need real coffee and cream to go with that brownie. Thanks for stopping by and commenting! I'm sure regular coffee tastes better, but I can't drink it. While the caffeine in tea doesn't bother me in the least, there must be some other chemical component of regular coffee that combines with the caffeine and does horrible things to me! That's true, Anne. If you weren't so far away, I'd have brought you comfort food after your darling dog died. I hope you'll talk about it a lot to your friends and family--it really helps to do so. These look perfect! I love brownies, almost anyway, really....but I prefer them to be chewy and not gooey like these! YUM! Can't wait to try these, thanks for sharing! Thanks, Jenn! I hope you like them as much as we do! I really like the 'might be' rather than 'are' distinction too... if we all applied this cognitive/linguistic tool to our beliefs and ideas we might be less inclined to go to war with each other! Thanks, Grant! Glad to hear your thoughts on the word choices as well. It's part of my nature to not be competitive in any area of life, especially in one that brings me such joy as cooking. That's why I don't watch the cooking shows that involve competition. They just make me tense! Hi Jean. How are you? Thank you for the nice comment on my blog. I hope you come and visit again. Thanks, Michael! Yes, I'll visit again. Must be chilly there in the north right now. We're having some most welcome rain. Either place, it's hearty food weather! Mary, thank you! Even I rather like them, and I'm not a huge fan of chocolate. I like ALL brownies - lol!! But to be honest, I like mine more on the chewy than fudgy side and these do indeed look like "perfect" brownies to me. Interesting that the recipe calls for a packed cup of flour - I have never seen that in a recipe and that may be the "trick" to perfect brownies!!! Thanks, Nancy! I develop all my recipes using a packed measure of flour. The explanation is on my FAQ page. I think it just makes sense! Thanks! Yes, make mine Ben & Jerry's! My husband likes his with whipped cream. Wow. I was looking for cocoa brownies that were chewy with just a touch of cake-iness b/c I don't like them too fudgey. These were EXACTLY what I wanted. I looked long and hard until I found this. Full of chocolate flavor with just the right texture. THANK YOU for posting this! Thanks so much for your comment! I really appreciate it and am so glad you like my brownies. Let me know if you try any of my other recipes. Jojo, if you measured all the ingredients correctly and used the correct size pan and baked at the specified temperature, the only reason I can think of for the brownies not to turn out well for you is a problem with your oven's thermostat. You should have that checked out by a technician. Aroosha, yes, but you might need to experiment with the amount. I would try 3/4 cup oil to replace the 1 cup of unsalted butter.